I dork therefore I am. * Yibb-Tstll is served by the Nightgaunts. All Nightgaunts have their horror damage increased to 3 Sanity. * While Yibb-Tstll stirs in her slumber, the difficulty of all Evade checks is increased by 1. * No investigator can have more than 5 Clue tokens at once. * Her combat check penalty is set to the number of Clue tokens left on the board. * It takes twice as many successes to remove each Doom Token from Yibb-Tstll's Doom Track. * When Yibb-Tstll attacks, each investigator rolls dice equal to his or her focus; any investigator who scores no successes is devoured. * A Cultist is placed on the first open gate at the start of the game in addition to the normal monsters that emerge from the gate. * When a Cultist adjacent to an elder sign token moves, it moves to that elder sign's location. The Sky is considered to be adjacent to all locations for this purpose. * If a Cultist begins the Mythos Phase in the same location as an elder sign token, the elder sign is discarded and the Cultist returns to the monster cup. 1. Jenny Barnes receives $10, a .45 Automatic, a Ley Line Map, a Pallid Mask, the Wither spell and the Expert Occultist skill. 2. Monterey Jack receives $7, 1 Clue, a Bullwhip, a .38 Revolver, an Enchanted Blade and an Illuminated Manuscript and the Speed skill. 3. Tony Morgan receives $6, 3 Clues, a Pair of Handcuffs, a Cross, the Masquerade of Nightand the Stealth skill. 4. Vincent Lee receives $9, a Flare Gun, a Safety Deposit Key, the spells Voice of Ra and Wither and the Lore skill. 5. Carolyn Fern receives $7, 1 Clue, an Athame, an Understudy's Script, a Gladius of Carcosa, the Eltdown Shards and the Stealth skill. 6. Daisy Walker receives $5, 1 Clue, the Livre d'Ivon, a Gladius of Carcosa, a Bullwhip, and the Marksman skill. 1. Jenny Barnes set her sliders to 3/1, 3/3 and 4/2. 2. Monterey Jack set his sliders to 4/0, 2/3, 1/5. 3. Tony Morgan set his sliders to 4/1, 3/3 and 0/6. 4. Vincent Lee set his sliders to 3/2, 2/2 and 5/1. 5. Carolyn Fern set her sliders to 2/1, 1/4, 4/3. 6. Daisy Walker set her sliders to 4/1, 2/3 and 5/1. * A Gate to R'lyeh opens at the Witch House! * The Clue at the Witch House is lost. * The Doom Track increases to 1. * Two monsters appear through the Gate at the Witch House: a Dark Young and an Elder Thing. * Tulzcha summons a Cultist at the Witch House. * A Clue appears at the Black Cave. * Investigators in Arkham may immediately spend any amount of Sanity, up to the current terror level or the investigator's current Sanity, whichever is lower. For each point of Sanity spent, the player gains 1 Clue token. * A Rift Marker for the North Point Lighthouse appears on the first Rift Track (1/4). 1. Jenny Barnes kept her sliders at 3/1, 3/3 and 4/2 and received $1 from her trust fun, bringing her up to $11. 3. Tony Morgan set his sliders to 4/0, 3/3 and 0/6. 5. Carolyn Fern kept her sliders at 2/1, 1/4, 4/3. 6. Daisy Walker kept her sliders at 4/1, 2/3 and 5/1. 1. Jenny Barnes moved to the Curiosite Shoppe. 2. Monterey Jack stayed in the Curiosite Shoppe and crossed his fingers that Jenny would leave him something interesting to buy. 3. Tony Morgan moved to The Unnamable(p)/the Unvisited Isle(s) and picked up the Clue there, bringing him up to 4 Clues. 4. Vincent Lee moved to the Woods and picked the Clue there up, bringing him to 2 Clues in total. 6. Daisy Walker moved to the Black Cave and collected the 2 Clues there, bringing her up to 3 Clues in total. 1. Jenny Barnes shopped and purchased the King In Yellow for $2, leaving her with $9. 2. Monterey Jack shopped and purchased a Puzzle Box for $6. 3. Tony Morgan stole a Gladius of Carcosa and was Cursed for his crime. 4. Vincent Lee fell afoul of the Sheldon Gang, losing 2 Stamina in the process, and ran at high speed back to the Uptown streets. 5. Carolyn Fern earned $4 for working on her day off. 6. Daisy Walker managed to decode a rapidly-vanishing message and learned the Storm of Spirits spell. * A Gate to The Dreamlands opens at the Graveyard! * The Clue at the Graveyard is lost. * The Doom Track increases to 2. * Two monsters appear through the Gate at the Graveyard: a Warlock and a Fire Vampire. * A Clue appears at the Unvisited Isle. * The Cultist moves to French Hill. * The Terror Level increases by 1! * Ruby Standish leaves town. * A Rift Marker for the Congregational Hospital appears on the first Rift Track (2/4). 1. Monterey Jack left his sliders unchanged at 4/0, 2/3, 1/5. 2. Tony Morgan kept his sliders unchanged at 4/0, 3/3 and 0/6. 3. Vincent Lee adjusted his sliders to 3/2, 2/2 and 5/1. 4. Carolyn Fern adjusted her sliders to 3/0, 1/4, 3/4 and restored 1 Sanity to herself. 5. Daisy Walker kept her sliders at 4/1, 2/3 and 5/1. 6. Jenny Barnes adjusted her sliders to 2/2, 3/3 and 4/2 and received $1 from her trust fund, bringing her up to $10. 2. Tony Morgan moved to General Store. 3. Vincent Lee moved to the Unvisited Isle and picked up the 2 Clues there, bringing him to 5 Clues in total. 4. Carolyn Fern decided to spend some time reading the reading the Understudy's Script, but couldn't make head nor tail of it. (1 Sanity lost.) She then tried to solve the Puzzle Box and gained 1 Clue from her efforts (2 total) but lost 1 more Sanity in the process. 5. Daisy Walker moved to the Silver Twilight Lodge and collected the Clue there, bringing her up to 4 Clues in total. 6. Jenny Barnes decided to read The King in Yellow while the owner of the Curiositie Shoppe scurried around looking for more objects to tempt her with. Jenny learned a lot from the play, gaining 4 Clues before discarding the tome, but losing 1 Sanity in the process. 1. Monterey Jack enjoyed a peaceful day in the company of some gypsies. 2. Tony Morgan bought some Dyanmite for $4. 3. Vincent Lee lost 1 Stamina from hunger as he struggled around the island. 4. Carolyn Fern gained 1 Clue by perusing old patient files. 5. Daisy Walker paid $3 to join the exlusive Silver Twilight Lodge. 6. Jenny Barnes bought a Carcosan Page for $4. * A Gate would open at The Witch House but one is already present - a monster surge occurs! * A Yithian and a Skeleton emerge from the Gate at The Witch House! A Ghast and a Nightgaunt emerge from the Gate at the Graveyard! A Cultist and a Ghost appear in the Outskirts! * The Doom Track remains at 2. * The Yithian moves to French Hill. The Fire Vampire and the Nightgaunt launch themselves into the Sky. * Investigators attempting to read Tomes in the Library receive a +2 bonus to their Lore Check for reading those Tomes. * A Rift Marker for Neil's Curiosity Shop appears on the third Rift Track (1/4). 1. Tony Morgan kept his sliders unchanged at 4/0, 3/3 and 0/6l the curse remained firmly in place on him. 2. Vincent Lee kept his sliders at 3/2, 2/2 and 5/1 and restored 1 Stamina to himself. 3. Carolyn Fern adjusted her sliders to 3/0, 1/4, 5/2 and restored 1 Sanity to herself. 4. Daisy Walker adjusted her sliders to 4/1, 0/5 and 5/1. 5. Jenny Barnes adjusted her sliders to 3/1, 3/3 and 4/2 and received $1 from her trust fund, bringing her up to $7. 6. Monterey Jack left his sliders unchanged at 4/0, 2/3, 1/5. 1. Tony Morgan moved to Independence Square. 2. Vincent Lee moved to the Curiositie Shoppe. 3. Carolyn Fern failed to solve the mysteries of the Understudy's Script or the Puzzle Box, despite spending a Clue and losing 2 Sanity. 4. Daisy Walker moved to French Hill and read from the Livre d'Ivon, learning the Mists of Releh spell before discarding the Tome. She then successfully cast Mists of Releh - augmented by 2 Clues - to find and defeat the Cultist. She then followed that by using her penultimate Clue to defeat the Yithian. 5. Jenny Barnes moved to the Miskatonic University streets. 6. Monterey Jack passed his Enchanted Blade to Tony Morgan and then moved to the Black Cave and collected the Clue there (3 Clues total). 1. Tony Morgan killed the Gnoph-keh that ambushed him and claimed it s a trophy. 2. Vincent Lee bought a Healing Stone for $8. 3. Carolyn Fern chased an intruder and gained the Powder of Ibn-Ghazi. 4. Daisy Walker kept the French Hill streets safe overnight. 5. Jenny Barnes kept the Mistakonic University streets safe overnight. 6. Monterey Jack had to use a Clue to find his way out of the Black Cave but managed to do so - and even recovered a Press Pass from the body of someone less fortunate than himself. * The Elder Thing and the Skeleton move to French Hill. The Ghast moves to Rivertown. The Fire Vampire and Nightgaunt move to French Hill. * A Monster Surge occurs! * A Formless Spawn appears from the Gate at The Witch House! A Byakhee appears from the Gate at the Graveyard! * A Nightgaunt would appear, but Arkham is full. The Outskirts are also full. All monsters are cleared from the Outskirts. * The Terror Level increases to 2! * The Terrible Old Man leaves Arkham. * A Crawling One and a Nightgaunt enter the Outskirts. A Moon-beast would appear, but Arkham is full. The Outskirts are also full. All monsters are cleared from the Outskirts. * The Terror Level increases to 3! * Young Zoog leaves Arkham. * The General Shop closes and the shopkeeper leaves town. * No rift marker appears. 1. Vincent Lee adjusted his sliders to 3/2, 3/1 and 5/1. He then cast Voice of Ra, using the Healing Stone to mitigate the Sanity loss before restoring 1 Stamina to himself. 2. Carolyn Fern adjusted her sliders to 3/0, 2/3, 4/3 and restored herself to 5 Sanity. 3. Daisy Walker adjusted her sliders to 4/1, 2/3 and 5/1. 4. Jenny Barnes left her sliders unchanged at 3/1, 3/3 and 4/2 and received $1 from her trust fund, bringing her up to $8. 5. Monterey Jack left his sliders unchanged at 4/0, 2/3, 1/5. 6. Tony Morgan kept his sliders unchanged at 4/0, 3/3 and 0/6; the curse remained firmly in place on him. 1. Vincent Lee moved to Rivertown and attacked the Ghast. The Ghast proved a formidable opponent, inflicting 1 Sanity and 3 Stamina damage on Vincent before finally being defeated. 2. Carolyn Fern moved to the Curiositie Shoppe. 3. Daisy Walker went into battle against a legion of monsters; she dispatched the Skeleton with the Storm of Spirits spell, then hacked the Fire Vampire, Elder Thing and Nightgaunt to pieces with her Gladius of Carcosa, although not before the Elder Thing inflicted 2 Sanity Damage. 4. Jenny Barnes moved to the Historical Society and picked up her 5th Clue. 5. Monterey Jack moved to the Science Building, passing Vincent $1 en route, and picked up his 3rd Clue; he then used his Press Pass to turn up a 4th Clue. 6. Tony Morgan moved to Hibbs Roadhouse and picked up his 5th Clue. 1. Vincent Lee kept the Rivertown streets safe. 2. Carolyn Fern purchased a Crystal of the Eldar Beings. 3. Daisy Walker kept the French Hill streets safe. 4. Jenny Barnes had the opportunity to learn a new Skill but wasn't lucky enough. 5. Monterey Jack attempted to appropriate something from the Science Building but was caught and delayed, despite using 1 Clue. 6. Tony Morgan nearly made $2 from an uncollected bounty, but Two Thumbs got away. * A Gate to the Great Hall of Celeano appears at the Black Cave! * A Cultist and a Nightgaunt emerge from the Gate at the Black Cave. * The Doom Track increases to 3. * A Clue appears at Hibbs Roadhouse. * The Byakhee moves to Rivertown. * A Rift Marker for the Artists Colony appears on the second Rift Track (1/4). * Sneak and Lore Checks in Arkham are made with a +1 Bonus. Will Checks in Arkham are made with a -2 penalty. 1. Carolyn Fern adjusted her sliders to 3/0, 1/4, 5/2 and restored herself to full Sanity. 2. Daisy Walker kept her sliders unchanged at 4/1, 2/3 and 5/1. 3. Jenny Barnes left her sliders unchanged at 3/1, 3/3 and 4/2 and received $1 from her trust fund, bringing her up to $9. 4. Monterey Jack adjusted his sliders to 2/2, 2/3, 1/5. 5. Tony Morgan kept his sliders unchanged at 4/0, 3/3 and 0/6; the curse remained firmly in place on him. 6. Vincent Lee adjusted his sliders to 1/4, 3/1 and 5/1. He then used the Healing Stone to heal himself of 1 point of Sanity damage before also restoring 1 Stamina to himself. 1. Carolyn Fern stayed in the Curiositie Shoppe and successfully read the Understudy's Script, gaining 2 clues (5 total) and learning the Bind Monster spell before discarding the Script. 2. Daisy Walker moved to Rivertown and despite taking 1 Sanity damage swiftly defeated the Byakhee, continuing her one-woman rampage against the unnatural. 3. Jenny Barnes used her Carcosan Page to take the Gladius of Carcosa from Monterey Jack, while wondering if the Page might work on that lovely diamond necklace she saw in Tiffany's of New York. Jenny then took the Enchant Weapon spell and the Bullwhip from Daisy Walker as she walked past, handing over $6 in exchange. Jenny then moved to the Witch House and attacked the creatures there. The Formless Spawn was swiftly dispatched using the Wither spell and the Gladius of Carcosa, but the Dark Young proved a tougher opponent. Losing 1 Sanity to the Dark Young's horrifying appearance and another 1 Sanity to use Enchant Weapon to render her .45 Automatic more potent, Jenny attacked... only to be beaten violently by the fell creature, losing 3 Stamina before finally gaining the upper hand. 4. Monterey Jack stood up. 5. Tony Morgan moved to the Black Cave, passing Vincent some Dynamite and receiving a Safety Deposit Key in exchange en route, and then discarded the Masquerade of Night to avoid being scared to death by the Nightgaunt before being flung through the Gate to the Great Hall of Celeano. 6. Vincent Lee gave his Healing Stone to Daisy before moving to the Graveyard. Defeating the Warlock took 2 Clues, although Vincent regained 2 when he banished the Warlock in turn. 1. Carolyn Fern purchased a copy of Nameless Cults for $3. 2. Daisy Walker kept the French Hill streets safe. 3. Jenny Barnes was pulled through the gate to R'lyeh. 4. Monterey Jack faced a dangerous fire and called campus security to deal with it. 5. Tony Morgan was dragged through the Gate to the Great Hall of Celeano. 6. Vincent Lee was pulled through the Gate to the Dreamlands. 1. Jenny Barnes outswam a dangerous predator. 2. Tony Morgan faced down a difficult library patron. 3. Vincent Lee was judged and found wanting, discarding all his possessions. * A Gate would appear at the Witch House but one is already present - a monster surge occurs! * A Shoggoth and a Tcho-tcho Priest emerge from the Gate at the Witch House!. A Zombie and a Cultist emerge from the Gate at the Black Cave! A Cultist and some Serpent People emerge from the Gate at the Graveyard! * The Doom Track remains at 3. * A Clue would appear at the Black Cave but is consumed by the Gate there. * The Nightgaunt moves to Rivertown. * A Rift Marker for The Hall School appears on the third Rift Track (2/4). * Hibb's Roadhouse is closed until the end of next turn. * No investigators are currently carrying Whiskey so nobody is arrested. 1. Daisy Walker adjusted her sliders to 4/1, 0/5 and 5/1 and used the Healing Stone to restore her Sanity to 3. 2. Jenny Barnes left her sliders unchanged at 3/1, 3/3 and 4/2 and received $1 from her trust fund, bringing her up to $4. 3. Monterey Jack adjusted his sliders to 4/0, 2/3, 1/5. 4. Tony Morgan kept his sliders unchanged at 4/0, 3/3 and 0/6; the curse remained firmly in place on him. 5. Vincent Lee adjusted his sliders to 1/4, 1/3 and 5/1. He then restored 1 Stamina to himself. 6. Carolyn Fern adjusted her sliders to 3/0, 2/3, 5/2 and restored herself to full Sanity. 1. Daisy Walker spent her last clue fighting the Nightgaunt, which swiftly overwhelmed her and threw her gate to the Great Hall of Celeano located at the Black Cave. 2. Jenny Barnes used her Carcosan Page return the Gladius of Carcosa to Monterey Jack and moved deeper into R'lyeh. 3. Monterey Jack moved to the Curiositie Shoppe and took $1 and the Puzzle Box from Carolyn, passing her his Gladius of Carcosa in exchange. 4. Tony Morgan moved deeper into the Great Hall of Celeano. 5. Vincent Lee moved deeper into the Dreamlands. 6. Carolyn Fern moved to a small diner off a street in the Merchant District and read her way through her copy of Nameless Cults, learning the spell Storm of Spirits before discarding the Tome. 1. Monterey Jack faced a dangerous fire and called campus security to deal with it. 2. Carolyn Fern purchased a copy of Nameless Cults for $3. 1. Daisy Walker failed to navigate the Great Hall's stacks of books. 2. Jenny Barnes lost her Enchant Weapon spell to knowledge thieves in the drowned city. 3. Tony Morgan failed to track down the cultist network connections into the Great Hall. 4. Vincent Lee lost 2 Stamina thanks to reality butterflies in the Dreamlands. * A Gate to the Abyss opens at the Historical Society! * A Ghost emerges from the Gate at the Historical Society! A Star Spawn emerges from the Gate at the Historical Society and enters the Outskirts. * The Doom Track increases to 4. * A Clue appears at the Congregational Hospital. * All three Cultists move to Rivertown along with the Serpent People and the Zombie. The Tcho-tcho Priest moves to Southside. * A Rift Marker for 607 Water Street appears on the first Rift Track (3/4). * Graverobbers accidentally release two monsters into the Central Hill Streets - a Vampire and a Formless Spawn! 1. Jenny Barnes adjusted her sliders to 2/2, 3/3 and 4/2 and received $1 from her trust fund, bringing her up to $5. 2. Monterey Jack adjusted his sliders to 4/0, 4/1, 1/5. 3. Tony Morgan kept his sliders unchanged at 4/0, 3/3 and 0/6; the curse remained firmly in place on him. 4. Vincent Lee adjusted his sliders to 0/5, 0/4 and 5/1. He then restored 1 Stamina to himself. 5. Carolyn Fern adjusted her sliders to 2/1, 1/4, 5/2 and restored herself to full Sanity. 6. Daisy Walker adjusted her sliders to 4/1, 0/5 and 3/3 and used the Healing Stone to restore her Sanity to 4. 1. Jenny Barnes emerged from the Gate to R'lyeh and returned to the Witch House. 2. Monterey Jack took an evasive and indirect path to Hibbs Roadhouse and collected the clue there, using his Press Pass to double the information gained (5 clues total). 3. Tony Morgan emerged from the Gate to the Great Hall of Celeano, returning to the Black Cave. 4. Vincent Lee emerged from the gate to the Dreamlands, returning to the Graveyard. 5. Carolyn Fern moved to Rivertown and attacked the monsters gathered there as if she were an angry librarian with a grudge. The Zombie was unnerving enough that Carolyn took 1 Sanity damage and failed to cast Storm of Spirits, but she soon hacked it to pieces with her Gladius of Carcosa and 3 clues. The Nightgaunt was positively terrifying, costing her 3 Sanity and forcing her to use the Crystal of the Elder Things and her last two clues to cast and discard Bind Monster, defeating the Nightgaunt. The Serpent People and Cultists proved too difficult to track down and chastise. 6. Daisy Walker moved deeper into the Great Hall of Celeano. 1. Jenny Barnes tried unsuccessfully to close the Gate to R'lyeh. 2. Monterey Jack won $5 in an impromptu drinking challenge. 3. Tony Morgan debated trying to close the Gate to the Great Hall of Celeano but decided against it. 4. Vincent Lee decided not to try and close the Gate to the Dreamlands. 5. Carolyn Fern tried to track Cultists around the Rivertown streets all night. 1. Daisy Walker gained 2 clues by following up an interesting lead in the Great Hall of Celeano but was delayed. * A Gate would open at the Black Cave but one is already present - a monster surge occurs! * A Dark Young emerges from the Gate at the Black Cave! [b]A Cultist emerges from the Gate at the Historical Society! * Serpent People enter the Outskirts. A Moon-Beast would enter the Outskirts, but the Outskirts are full - the Outskirts are cleared, and the Terror Track increases to 4. * William Bain leaves town. * A Gug and a Ghoul enter the Outskirts. * The Doom Track remains at 4. * A Clue appears at Hibb's Roadhouse. * A Rift Marker for the Congregational Hospital appears on the third Rift Track (2/4). * Sneak and Will checks are made at a -1 Penalty. 1. Monterey Jack left his sliders unchanged at 4/0, 4/1, 1/5. 2. Tony Morgan kept his sliders unchanged at 4/0, 3/3 and 0/6; the curse remained firmly in place on him. 3. Vincent Lee adjusted his sliders to 1/4, 1/3 and 5/1. He then restored 1 Stamina to himself, bringing him up to 4. 4. Carolyn Fern left her sliders unchanged at 2/1, 1/4, 5/2 and restored herself to 3 Sanity. 5. Daisy Walker adjusted her sliders to 3/2, 0/5 and 3/3 and used the Healing Stone to restore her Sanity to maximum. 6. Jenny Barnes left her sliders unchanged at 2/2, 3/3 and 4/2 and received $1 from her trust fund, bringing her up to $6. 1. Monterey Jack moved to the Curiositie Shoppe. 2. Tony Morgan tried to fight the Dark Young but despite using all 5 clues he was beaten unconscious, waking some time later in St. Mary's Hospital missing his Handcuffs and Safety Deposit Key. 3. Vincent Lee moved to Rivertown and took a Gladius of Carcosa from Carolyn Fern. All of the monsters at Rivertown successfully eluded him. 4. Carolyn Fern stayed in Rivertown and so terrified the monsters that they continued to avoid her at all costs. 5. Daisy Walker tried to move closer to the exit from the Great Hall of Celeano. 6. Jenny Barnes used the Mists of Releh spell to avoid the Shoggoth as she continued to lurk at the Witch House outside the Gate to R'lyeh. 1. Monterey Jack bought an Enchanted Knife for $5. 2. Tony Morgan spent some time recovering in St. Mary's Hospital. 3. Vincent Lee kept Rivertown safe. 4. Carolyn Fern kept Rivertown safe. 5. Jenny Barnes tried unsuccessfully to close the Gate to R'lyeh. 1. Daisy Walker lost 1 Sanity. Daffodils were involved. * An Elder Thing would enter the Outskirts, but the Outskirts are full - the Outskirts are cleared, and the Terror Track increases to 5. * Richard Upton Pickman leaves town. * A Witch and a Gug enter the Outskirts. * A Dimensional Shambler would enter the Outskirts, but the Outskirts are full - the Outskirts are cleared, and the Terror Track increases to 6. * Dr. Herbert West leaves town. * A Yithian and a Dark Young enter the Outskirts. * The Curiositie Shoppe closes, and Monterey Jack is moved into the Northside streets. * A Clue would appear at the Black Cave but is swallowed by the Gate there. * A Rift Marker for the Rope & Anchor appears on the second Rift Track (3/4). * While Planetary Alignment is in play the Sanity cost of all spells is reduced to 0. 1. Tony Morgan kept his sliders unchanged at 4/0, 3/3 and 0/6; the curse remained firmly in place on him. 2. Vincent Lee adjusted his sliders to 0/5, 2/2 and 5/1. He then restored 1 Stamina to himself, bringing him up to 5. 3. Carolyn Fern adjusted her sliders to 2/1, 3/2, 5/2 and restored herself to 4 Sanity. 4. Daisy Walker adjusted her sliders to 3/2, 0/5 and 5/1 and used the Healing Stone to restore her Sanity to maximum. 5. Jenny Barnes left her sliders unchanged at 2/2, 3/3 and 4/2 and received $1 from her trust fund, bringing her up to $7. She then used her Carcosan Page to send her Pallid Mask to Vincent Lee. 6. Monterey Jack adjusted his sliders to 3/1, 5/0 and 1/5. 1. Tony Morgan decided to stay in St. Mary's Hospital. 2. Vincent Lee used the Pallid Mask to track down and defeat two Cultists, claiming them as trophies. 4. Daisy Walker walked out of the the Great Hall of Celeano and back into Arkham, celebrating her return by brutally slaughtering the nearby Dark Young and claiming it as a trophy, losing 1 Sanity in the process. 5. Jenny Barnes used the Mists of Releh spell to avoid the Shoggoth as she continued to lurk at the Witch House outside the Gate to R'lyeh. 6. Monterey Jack moved to the Railway Station and paid $1 to travel to Central Hill. He then defeated the Vampire and Formless Thing, gaining them as trophies but losing 3 Clues and 2 Sanity in the struggle. 1. Tony Morgan spent $2 for professional medical help, restoring his Sanity to maximum. 2. Vincent Lee kept Rivertown safe. 3. Carolyn Fern kept Rivertown safe. 4. Daisy Walker closed the Gate to the Great Hall of Celeano. 4. Jenny Barnes tried unsuccessfully to close the Gate to R'lyeh. 5. Monterey Jack kept French Hill safe. * A Gate to Yuggoth opens at The Unnamable! * A Witch and a Dimensional Shambler emerge from the Gate at The Unnamable. * The Doom Track increases to 5. * A Clue appears at the Woods. * While Spawn of Yog-Sothoth is in play all Cultists have Magical Immunity. 1. Vincent Lee kept his slider unchanged at 0/5, 2/2 and 5/1. 2. Carolyn Fern adjusted her sliders to 2/1, 4/1, 5/2 and restored herself to 5 Sanity. 3. Daisy Walker adjusted her sliders to 3/2, 2/3 and 5/1 and used the Healing Stone to restore her Sanity to maximum. 4. Jenny Barnes adjusted her sliders to 2/2, 4/2 and 4/2 and received $1 from her trust fund, bringing her up to $8. She then used her Carcosan Page to obtain the Healing Stone and used it to restore 1 Sanity. 5. Monterey Jack adjusted his sliders to 3/1, 3/2 and 1/5. 1. Vincent Lee used the Pallid Mask to try and track down the remaining Cultist and the Serpent People lurking in Rivertown, but without success. 2. Carolyn Fern moved to Southside and attacked the Tcho-tcho Priest, losing 2 Sanity but swiftly dispatching it with her Athame. 3. Daisy Walker moved to The Unnamable, passing Vincent $3 as she moved past him; she then defeated the Witch with Storm of Spirits, proving herself to be a far superior thaumaturgist, before attacking and defeating a Dimensional Shambler at the cost of 1 Sanity. 4. Jenny Barnes used Mists of Releh to avoid the Shoggoth. 5. Monterey Jack moved to the Congregational Hospital, picking up the Clue there and using his Press Pass to gain a second (4 Total). 6. Tony Morgan moved to Downtown. 1. Vincent Lee kept Rivertown safe. 2. Carolyn Fern kept Southside safe. 3. Daisy Walker was drawn through the gate to Yuggoth. 5. Monterey Jack gained 1 Clue from a useful conversation with Dr. Harris. He also discarded the Congregational Hospital Rift Marker on the first Rift Track. 6. Tony Morgan kept Downtown safe. 1. Daisy Walker ran the risk of being Delayed. * A Gate would open at the Witch House, but one is already present - a Monster Surge occurs! * A Zombie emerges from the Gate at the Witch House. A Hound of Tindalos emerges from the Gate at the Graveyard. A Ghoul emerges from the Gate at the Historical Society. A Fire Vampire emerges from the Gate at The Unnamable. * A Shan attempts to enter the Outskirts, but the Outskirts are full; the Outskirts are cleared, and the Terror Track increases to 7. * A Chthonian enters the outskirts. * The Hound of Tindalos moves to the Witch House. * A Rift Marker for The 7th House on the Left appears on the second Rift Track (4/4). The second Rift Track is full! * A Rift (Black Star) opens at the Witch House! * The Serpent People and the Cultist at Rivertown are returned to the monster cup. 1. Carolyn Fern adjusted her sliders to 2/1, 3/2, 5/2 and restored herself to 3 Sanity. 2. Daisy Walker left her sliders unchanged at 3/2, 2/3 and 5/1. 3. Jenny Barnes adjusted her sliders to 2/2, 3/3 and 4/2 and received $1 from her trust fund, bringing her up to $9. She then used her Carcosan Page to obtain the Gladius of Carcosa from Jack, and used the Healing Stone to restore 1 Sanity. 4. Monterey Jack kept his sliders unchanged at 3/1, 3/2 and 1/5. 6. Vincent Lee changed his sliders to 1/4, 1/3 and 5/1. 1. Carolyn Fern moved to the Woods and picked up the clue there. 2. Daisy Walker stood up. 3. Jenny Barnes attacked and easily defeated the Zombie. The Hound of Tindalos proved a tougher foe, reducing Jenny to 1 Sanity before she defeated it, and as a consequence she used the Mists of Releh to evade the Shoggoth. 4. Monterey Jack moved to the Artist's Colony. 5. Tony Morgan moved to Arkham Asylum. 7. Vincent Lee moved to French Hill. 1. Carolyn Fern was swallowed by a Gate to Yuggoth, which opened at the Woods and released a Werewolf into Arkham. 2. Jenny Barnes tried unsuccessfully to close the Gate to R'lyeh. 3. Monterey Jack impressed a cat and removed/flipped two Rift Markers. 4. Tony Morgan decided to undergo some basic therapy, gaining 1 Sanity. 5. Vincent Lee kept French Hill safe. 1. Carolyn Fern lost 1 Stamina but avoided drowning. 2. Daisy Walker lost 2 Sanity at the hands - and minds - of her tormentors. * A Gate would open at the Graveyard, but one is already present - a Monster Surge occurs! * The Doom Track remains at 6. * A Leng Spider emerges from the Gate at the Graveyard. A Ghost emerges from the Gate at The Unnamable and some Serpent People emerge from the Gate at the Historical Society. * A Cultist and a Shoggoth fill the Outskirts to overflowing; the Outskirts are cleared, and the Terror Track increases to 8. * Professor Armitage leaves town. * A Leng Spider enters the outskirts. * A Clue appears at the Library. * The Leng Spider moves to Rivertown. * The Rift moves to French Hill and spits a Nightgaunt into the Outskirts. * The Doom Track increases to 7. * A Rift Marker for Congregational Hospital appears on the First Rift Track (3/4). * The first investigator to visit South Church while Hallelujah is in play will be blessed, at which point this card will be discarded. 1. Daisy Walker adjusted her sliders to 3/2, 4/1 and 5/1. 2. Jenny Barnes left her sliders unchanged at 2/2, 3/3 and 4/2 and received $1 from her trust fund, bringing her up to $10. She then used the Healing Stone to restore herself to 2 Sanity. 3. Monterey Jack adjusted his sliders to 4/0, 3/2 and 1/5. 5. Vincent Lee changed his sliders to 2/3, 0/4 and 5/1. 6. Carolyn Fern adjusted her sliders to 2/1, 3/2, 4/3 and 1 Sanity to herself. 2. Jenny Barnes attempted to use Mists of Releh to evade the Shoggoth. 3. Monterey Jack moved to the Rope & Anchor. 4. Tony Morgan moved to the Library and picked up the clue there (1 total). 5. Vincent Lee moved to French Hill and swiftly dispatched the Ghoul lurking there. 6. Carolyn Fern moved deeper into Yuggoth. 1. Jenny Barnes tried unsuccessfully to close the Gate to R'lyeh despite spending 5 Clues in the attempt. 2. Monterey Jack was too late to get into the Rope and Anchor and instead had to wander the South Shore streets. 3. Tony Morgan got soaked, bitten, battered and then evicted back into the Miskatonic University streets. 4. Vincent Lee kept French Hill safe. 1. Daisy Walker discarded her Gladius of Carcosa and returned to Arkham. 2. Carolyn Fern avoided being Lost in Time and Space. * A Gate would open at the Woods, but one is already present - a Monster Surge occurs! * The Doom Track remains at 7. * A Gug enters the Woods. * A Byakhee causes the Outskirts to clear; the Terror Track increases to 9. * Ye Olde Magick Shoppe closes. * Anna Kaslow leaves town. * A Leng Spider and a Ghoul fill the Outskirts; a Crawling One causes them to overflow and clear.The Terror Track increases to 10. * Thomas Olney leaves town. The only remaining ally in play is Eric Colt. * The monster limit is removed for the remainder of the game. * A Clue would appear at the Historical Society but is lost to the Gate. * The Leng Spider moves to Easttown. The Gug moves to Uptown. The Fire Vampire moves to Miskatonic University. * The Rift moves to Rivertown and spits a Crawling One into the streets. * The Doom Track increases to 8. * No Rift Marker appears this turn. * Jenny, Jack and Carolyn were Blessed; Tony Morgan's Curse was vanquished. 1. Jenny Barnes left her sliders unchanged at 2/2, 3/3 and 4/2 and received $1 from her trust fund, bringing her up to $11. She then used the Healing Stone to restore 1 Stamina to herself before sending the Mists of Releh spell to Daisy via the Carcosan Page. 2. Monterey Jack left his sliders unchanged at 4/0, 3/2 and 1/5. 3. Tony Morgan kept his sliders unchanged at 4/0, 3/3 and 0/6. 4. Vincent Lee changed his sliders to 2/3, 1/3 and 4/2. 5. Carolyn Fern adjusted her sliders to 2/1, 2/3, 5/2 and restored herself to 5 Sanity. 6. Daisy Walker adjusted her sliders to 3/2, 2/3 and 5/1. 1. Jenny Barnes attacked the Shoggoth despite it's terrifying appearance; although the battle reduced her to just 1 Sanity, she dispatched the fell creature and claimed it as a trophy. 2. Monterey Jack moved back to the Rope & Anchor. 3. Tony Morgan attacked the Fire Vampire preying on people at Miskatonic University, swiftly dispatching it and claiming it as a trophy. 4. Vincent Lee moved to South Church and was Blessed; the Hallelujah! environment is discarded. 5. Carolyn Fern emerged from the Gate at the Historical Society and attacked the Ghost, defeating it with the Storm of Spirits spell at the cost of 2 Sanity. 6. Daisy Walker emerged from the Gate to Yuggoth located at the Woods and swiftly searched for monsters to dispatch. 1. Jenny Barnes found that even though she'd beaten the Shoggoth into a pile of decomposing ectoplasm, she still couldn't close the Gate to R'lyeh. 3. Tony Morgan celebrated the removal of his curse by keeping the Miskatonic University streets safe. 4. Vincent Lee cleansed South Church of blasphemous heretics, restoring himself to full Sanity in the process. 5. Carolyn Fern closed the Gate to Yuggoth, banishing the Crawling One. 6. Daisy Walker successfully closed the Gate to Yuggoth and took it as a Trophy. * The Doom Track remains at 8. * The Cultist and the Serpent People move to Southside. The Leng Spider moves to Rivertown. The Gug moves to Miskatonic University. * An Elder Thing and some Serpent People appear at the Witch House. A Warlock and a Moon-Beast appear at the Graveyard. A Shan and a Crawling One appear at the Historical Society. * Jenny, receives 1 Clue. 1. Monterey Jack adjusted his sliders to 4/0, 2/3 and 1/5. 2. Tony Morgan kept his sliders unchanged at 4/0, 3/3 and 0/6. He then cashed in his Fire Vampire for $2. 3. Vincent Lee changed his sliders to 1/4, 0/4 and 4/2. 4. Carolyn Fern adjusted her sliders to 3/0, 1/4, 5/2 and restored herself to 4 Sanity. She also retained her Blessing. 5. Daisy Walker adjusted her sliders to 3/2, 0/5 and 5/1. 6. Jenny Barnes left her sliders unchanged at 2/2, 3/3 and 4/2 and received $1 from her trust fund, bringing her up to $12. She then used the Healing Stone to restore herself to 3 Stamina to herself before sending the Gladius of Carcosa to Tony via the Carcosan Page. 1. Monterey Jack moved to the North Point Lighthouse. 2. Tony Morgan defeated the Gug trophy but took 1 Stamina damage in the fight. 4. Carolyn Fern moved to Rivertown and defeated the Leng Spider there using the Storm of Spirits although she lost 1 Stamina in the process. 5. Daisy Walker moved to South Church. 6. Jenny Barnes attacked the Elder Thing and defeated it using the Wither spell, although it cost her a Clue. 1. Monterey Jack couldn't recruit Basil Eaton at the North Point Lighthouse, but he did cause a Rift Token to be discarded. 2. Tony Morgan found the Miskatonic University streets comfortably familiar as he spent the day prowling around, looking for ferocious monsters to vanquish. 3. Vincent Lee was diagnosed as suffering from Memory Loss by the doctors at St. Mary's Hospital. 4. Carolyn Fern kept the Rivertown streets safe. 5. Daisy Walker traded in her Nightgaunt, Byakhee, Witch and Dimensional Shambler monster trophies to gain the attention of a higher being, and had Tony Morgan Blessed. 6. Jenny Barnes found that even though she'd beaten the Elder Thing into a pile of decomposing ectoplasm, she still couldn't close the Gate to R'lyeh. * A Gate to The Underworld opens at the Woods. * The Doom Track increases to 9. * A Dimensional Shambler and a Mi-Go emerge from the Gate to The Underworld. * The Cultist and the Serpent People move to French Hill. The Werewolf moves to Southside..
* A Rift Marker for the Rope and Anchor appears on the third Rift Track (3/4). * A Clue appears at Independence Square. * While Off Broadway is in play all purchases in Arkham cost $1 more than normal. 1. Tony Morgan adjusted his sliders to 4/0, 1/5 and 0/6. 2. Vincent Lee changed his sliders to 3/2, 0/4 and 4/2 but found his Blessing fading away. 3. Carolyn Fern adjusted her sliders to 3/0, 2/3, 5/2 and restored herself to 5 Sanity. Her Blessing faded away. 4. Daisy Walker kept her sliders unchanged at 3/2, 0/5 and 5/1. 5. Jenny Barnes adjusted her sliders to 3/1, 3/3 and 4/2 and received $1 from her trust fund, bringing her up to $13. She then used the Healing Stone to restore her Stamina to maximum. 6. Monterey Jack left his sliders unchanged at 4/0, 2/3 and 1/5. 1. Tony Morgan moved to the Historical Society and defeated the Ghost, Shan and the Crawling One, although the Crawling One nearly drove him insane. 2. Vincent Lee moved to the Merchant District. 3. Carolyn Fern began by successfully reading the Eltdown Shards; the fell tome cost her 2 Sanity, but she brought the world back from the edge of destruction, removing 1 Doom Token from the Doom Track. She then moved to the Black Cave and picked up the Clue there, bringing her up to 2 Clues. 4. Daisy Walker decided to stay in South Church but spent some time studying the Illuminated Manuscript and gained the Sneak skill before discarding the eldritch tome. 5. Jenny Barnes moved to the Merchant District. 6. Monterey Jack moved to the Rope and Anchor. 1. Tony Morgan was drawn through the Gate and into the Abyss. 2. Vincent Lee kept the Merchant District streets safe. 3. Carolyn Fern kept the Rivertown streets safe. 4. Daisy Walker traded in her Dark Young and Skeleton monster trophies to gain the attention of a higher being, and had Dr. Vincent Lee Blessed. 5. Jenny Barnes kept the Merchant District streets safe, patrolling alongside Dr. Vincent Lee - who kept calling her Dorothy, for some reason. 6. Monterey Jack couldn't recruit Basil Eaton at the North Point Lighthouse, but he did cause a Rift Token to be discarded. 1. Tony Morgan was ambushed by a Chthonian, but swiftly defeated it. 2. Carolyn Fern was returned to Arkham unexpectedly by a great power. * A Gate would open at the Graveyard but one is already present - a monster surge occurs! * A Shoggoth and a Witch emerge from the Gate at the Graveyard. A Maniac emerges from the Gate at the Witch House. A Ghoul emerges from the Gate at the Historical Society. A Nightgaunt emerges from the Gate at the Woods. A Leng Spider emerges from the Gate at the Black Cave. * The Doom Track remains at 9. * The Shoggoth moves to French Hill. The Mi-Go launches itself into the Sky. * A Rift Marker for the North Point Lighthouse appears on the second Rift Track (1/4). * While Solar Eclipse is in play no spells may be cast. 1. Vincent Lee changed his sliders to 2/3, 1/3 and 4/2. 2. Carolyn Fern adjusted her sliders to 3/0, 4/1, 5/2 and restored herself to 5 Sanity. Her Blessing faded away. 3. Daisy Walker kept her sliders unchanged at 3/2, 0/5 and 5/1. 4. Jenny Barnes left her sliders unchanged at 3/1, 3/3 and 4/2 and received $1 from her trust fund, bringing her up to $14. She then used the Healing Stone to restore 1 point of Sanity. 5. Monterey Jack left his sliders unchanged at 4/0, 2/3 and 1/5. Unfortunately, his Blessing faded away. 6. Tony Morgan adjusted his sliders to 4/0, 3/3 and 0/6. 1. Vincent Lee moved to Independence Square and picked up the Clue there. 2. Carolyn Fern attacked and swiftly defeated the Ghoul, but the Leng Spider proved too much; she lost her Crystal of the Elder Things and Athame in the struggle as the Leng Spider savaged her into unconsciousness. 3. Daisy Walker decided to stay in South Church a little while longer. 4. Jenny Barnes moved to Hibbs Roadhouse and picked up the clue there. 5. Monterey Jack moved through Central Hill, paying $1 to catch a train back to Arkham, before moving to the Northside streets. 6. Tony Morgan moved into the outer reaches of the Abyss. 1. Vincent Lee caught someone spying on him. 2. Carolyn Fern woke in St. Mary's Hospital. 3. Daisy Walker traded in her Elder Thing and Yithian to gain herself a Blessing in recognition of her hard work. 4. Jenny Barnes earned $2 in thanks for stopping a thief at Hibbs Roadhouse. 5. Monterey Jack kept the Northside streets safe. 1. Tony Morgan regained 1 Stamina. * A Gate would open at the Silver Twilight Lodge but reality has already been strained too much by the five open Gates dotted around Arkham. The Cultists have succeeded in putting Tulzcha's plan in place - Yibb-Tstll has arrived! 1. Carolyn Fern adjusted her sliders to 3/0, 4/1, 5/2 and restored herself to 5 Sanity. Her Blessing faded away. 2. Daisy Walker adjusted her sliders to 3/2, 2/3 and 5/1. 3. Jenny Barnes adjusted her sliders to 3/1, 4/2 and 4/2 and retained her Blessing. 4. Monterey Jack adjusted his sliders to 4/0, 4/1 and 1/5. 5. Tony Morgan adjusted his sliders to 4/0, 4/2 and 0/6 and retained his Blessing. 6. Vincent Lee changed his sliders to 2/3, 3/1 and 4/2 and retained his Blessing. 1. Carolyn Fern passed the Powder of Ibn-Ghazi to Daisy Walker. 2. Monterey Jack passed his Bullwhip to Tony Morgan and his .38 Revolver and Enchanted Knife to Vincent Lee. 3. Vincent Lee passed his Gladius of Carcosa to Monterey Jack. 1. Carolyn Fern scored 1 success by attacking with Storm of Spirits (1 success total). 2. Daisy Walker scored 5 successes by attacking with Storm of Spirits (6 successes total). 3. Jenny Barnes scored 7 sucesses by attacking with her .45 Automatic and the Wither spell (13 successes total). 4. 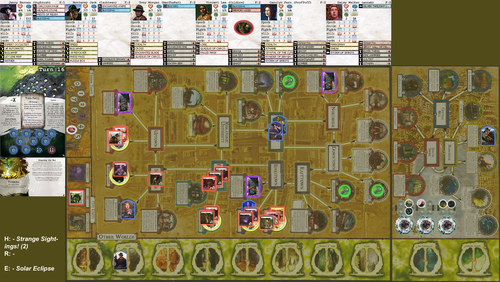 Monterey Jack scored 4 successes by attacking with his Gladius of Carcosa (17 successes total). 5. Tony Morgan scored 10 successes by attacking with an Enchanted Blade, a Gladius of Carcosa and a Bullwhip (27 successes total). 6. Vincent Lee scored 5 successes by attacking with an Enchanted Knife and a .38 Revolver (32 successes total). Carolyn scored 2 successes when Yibb-Tstll attacked; Carolyn weathered the attack and was Blessed. 1. Daisy Walker adjusted her sliders to 3/2, 3/2 and 5/1 and retained her Blessing. 2. Jenny Barnes left her sliders unchanged at 3/1, 4/2 and 4/2 and retained her Blessing. 3. Monterey Jack adjusted his sliders to 4/0, 5/0 and 1/5. 4. Tony Morgan left his sliders unchanged at 4/0, 4/2 and 0/6 and retained his Blessing. 5. Vincent Lee left his sliders unchanged at 2/3, 3/1 and 4/2 but lost his Blessing. 6. Carolyn Fern left her sliders unchanged at 3/0, 4/1, 5/2. 1. Daisy Walker transferred her Storm of Spirits spell to Vincent Lee. 1. Daisy Walker scored 10 successes by attacking with Powder of Ibn-Ghazi (18 successes total). 2. Jenny Barnes scored 5 sucesses by attacking with her .45 Automatic and the Wither spell (23 successes total). 3. Monterey Jack scored 1 successes by attacking with his Gladius of Carcosa (24 successes total). 4. Tony Morgan scored 7 successes by attacking with an Enchanted Blade, a Gladius of Carcosa and a Bullwhip (31 successes total). 5. Vincent Lee scored 3 successes by attacking with an Enchanted Knife and a .38 Revolver (34 successes total). 6. Carolyn Fern scored 3 successes by attacking with Storm of Spirits (37 success total). Daisy scored 1 success when Yibb-Tstll attacked; Daisy wasn't phased by the fell being. 1. Jenny Barnes left her sliders unchanged at 3/1, 4/2 and 4/2 and retained her Blessing. 2. Monterey Jack adjusted his sliders to 4/0, 5/0 and 1/5. 3. Tony Morgan left his sliders unchanged at 4/0, 4/2 and 0/6 and retained his Blessing. 4. Vincent Lee left his sliders unchanged at 2/3, 3/1 and 4/2. 5. Carolyn Fern left her sliders unchanged at 3/0, 4/1, 5/2 and retained her Blessing. 6. Daisy Walker kept her sliders unchanged at 3/2, 3/2 and 5/1 but lost her Blessing. 1. Jenny Barnes transferred her Wither spell, her .45 Automatic and Bullwhip to Daisy Walker. 1. Jenny Barnes scored 1 sucess by attacking with her bare hands (2 successes total). 2. 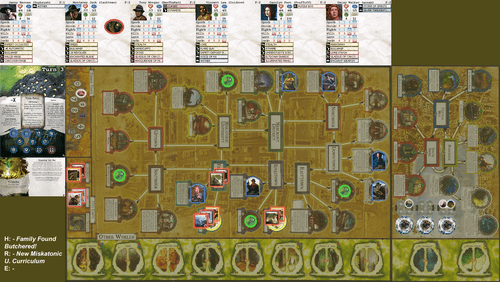 Monterey Jack scored 4 successes by attacking with his Gladius of Carcosa (6 successes total). 3. Tony Morgan scored 7 successes by attacking with an Enchanted Blade, a Gladius of Carcosa and a Bullwhip (13 successes total). 4. Vincent Lee scored 2 successes by attacking with an Enchanted Knife and a .38 Revolver (15 successes total). 5. Carolyn Fern scored 3 successes by attacking with Storm of Spirits (18 success total). 6. Daisy Walker scored 4 successes by attacking with the Wither spell, .45 Automatic and Bullwhip. (22 successes total). 1. Monterey Jack adjusted his sliders to 4/0, 5/0 and 1/5. 2. Tony Morgan left his sliders unchanged at 4/0, 4/2 and 0/6 and retained his Blessing. 3. Vincent Lee adjusted his sliders to 2/3, 3/1 and 5/1. 4. Carolyn Fern left her sliders unchanged at 3/0, 4/1, 5/2 and retained her Blessing. 5. Daisy Walker kept her sliders unchanged at 3/2, 3/2 and 5/1. 1. Monterey Jack transferred her Gladius of Carcosa to Carolyn Fern. 2. Vincent Lee transferred his .38 Revolver to Carolyn Fern. 1. Monterey Jack scored 2 successes by attacking with his bare hands (12 successes total). 2. Tony Morgan scored 5 successes by attacking with an Enchanted Blade, a Gladius of Carcosa and a Bullwhip (17 successes total). 3. Vincent Lee scored 4 successes by attacking with the Storm of Spirits spell (21 successes total). 4. Carolyn Fern scored 7 successes by attacking with .38 Revolver and the Gladius of Carcosa (28 successes total). 5. Daisy Walker scored 4 successes by attacking with the Wither spell, .45 Automatic and Bullwhip. (32 successes total). 1. Tony Morgan left his sliders unchanged at 4/0, 4/2 and 0/6 and retained his Blessing. 2. Vincent Lee left his sliders unchanged at 2/3, 3/1 and 5/1. 3. Carolyn Fern left her sliders unchanged at 3/0, 4/1, 5/2 and retained her Blessing. 4. Daisy Walker kept her sliders unchanged at 3/2, 3/2 and 5/1. 1. Tony Morgan transferred his Enchanted Blade, Gladius of Carcosa and Bullwhip to Vincent Lee. 1. Vincent Lee transferred his Enchanted Knife to Tony Morgan. 1. Tony Morgan scored 5 successes by attacking with an Enchanted Knife (13 successes total). 2. Vincent Lee scored 6 successes by attacking with the Enchanted Blade, Gladius of Carcosa and Bullwhip (19 successes total). 3. Carolyn Fern scored 4 successes by attacking with .38 Revolver and the Gladius of Carcosa (23 successes total). 4. Daisy Walker scored 2 successes by attacking with the Wither spell, .45 Automatic and Bullwhip. (25 successes total). Yibb-Tstll failed to devour Tony Morgan. Perhaps that Curse had ruined the taste?